Fairy Floss Machine | JOLLY JACKS JUMPING CASTLES! Everyone loves fairy floss (cotton candy)! Birthday parties, fetes, charities, school events, movie nights, corporate events; doesn’t matter the occasion, it’s not a party without fairy floss. 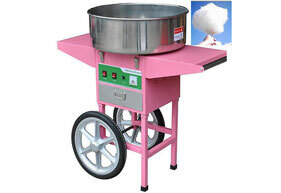 Fairy floss certainly adds colour, fun and excitement to all events. Jolly Jack’s fairy floss machine hire comes all inclusive ready to spin, and available in a variety of colours and flavours. Book one today and make your special day full of fairy floss fun! Who doesn’t like spinning then eating fairy floss! FREE delivery & set-up throughout Melbourne: Jolly Jacks Jumping Castles professional staff will deliver the fairy floss machine and all necessary ingredients, whilst instructing you on how to operate the machine. Actually, it is extremely easy to operate, and lots of fun while doing it – although must always be done by an adult and the fairy floss machine needs to stop for 20 minutes every hour. Fairly floss machine comes with cart and cover dome. All you need to provide is a 240 volt power outlet.Cleaning: NO CLEANING REQUIRED. Important – you do not clean the fairy floss machine. Jolly Jacks Jumping Castles will pick up the machine and conduct all proper cleaning. Price: Overnight fairy floss machine hire at $120, all inclusive for 100 servings, fully set up and with all necessary ingredients, including holding sticks.